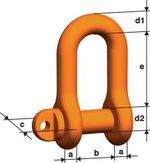 This high-strength shackle with a stud bolt in grade 10 and marked accordingly prevents mix-ups and is suitable for general lifting purposes. Both sides of the smooth bolt rest in the eyes and the thread does not protrude into the opening of the shackle. Please check that the bolt is sitting tightly prior to each lifting operation. If this precaution is observed, the shackle can cope with even the most demanding lifting operations. However, please note that the shackle cannot be mounted directly into the chain. Every single one of these safety products comes with CE-marking and a full operating manual.